Minor Shelfwear. Good condition book. Good condition is defined as: a copy that has been read but remains in clean condition. All of the pages are intact and the cover is intact and the spine may show signs of wear. The book may have minor markings which are not specifically mentioned. Most items will be dispatched the same or the next working day. Great part of the "series"
I am a big Patterson fan, and really enjoy this series. I have not been disappointed yet with any of the parts of this series. The main characters are developed well, and I find the books to never get "old". This is the sixth in the Women's Murder Club series, but it is the best of the bunch so far. Characters continue to grow with each book, and the action is tremendous. Fortunately, these gals know how to be in relationship with each other -- something many of us can strive for. They laugh together, weep together, and know when to step back and let someone process. Two main stories are interwoven in the novel, keeping the reader interested all the time. Read it and you won't regret you did! I really enjoy ALL of James Patterson's books, but my wife and I like the Women's Murder Club series the best! We can't wait to see what trouble Lindsey is going to get into next and how see is going to solve the problem. James Patterson hasn't let us down yet and he didn't with this book either...it is a must read...for both women and men. I REALLY ENJOY JAMES PATTERSONS' NEW WOMEN'S SERIES, BUT IT'S NOT JUST FOR WOMEN TO READ. THIS 6TH INSTALLMENT HAS ITS' USUAL SUSPENSE, DRAMA AND A FEW SURPRISES TOO. WE'VE BECOME CLOSE WITH THE CHARACTERS AND ARE EXCITED TO SEE WHAT LIFE UNEXPECTITIES WILL HAPPEN NEXT. HEY, I LIKE THAT WORD, I JUST MADE IT UP! 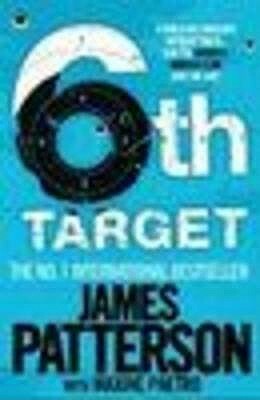 THE 6TH TARGET IS A GREAT READ BY ITSELF, BUT IF YOU LIKE THE SERIES, THIS ONE IS A MUST. All James Patterson books are great - this was no exception! !